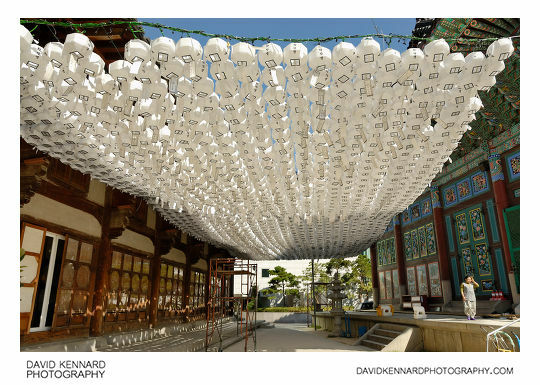 Here's another view of the white paper lanterns at Jogyesa temple. Each of the lanterns has a prayer card attached to the bottom. You can also see they have electric light bulbs to light the lanterns up at night. Quite sensible as it would take ages to light all those lanterns if they were using candles. It would probably be a fire risk to use candles as well. 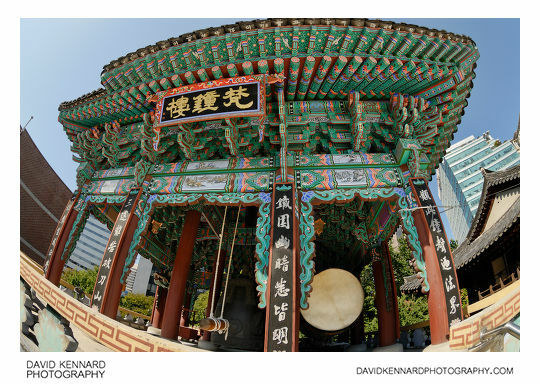 The white paper lanterns are hung between Geungnakjeon hall (Hangeul: 극락전 Hanja: 極樂殿) on the left, and the main hall, Daeungjeon (Hangeul: 대웅전; Hanja: 大雄殿) on the right. You can see the platforms here that the monks would use to add new lanterns and check the bulbs etc. I wasn't sure whether it was okay to take photos inside the main temple hall, and they were having a service in there anyway. But I took this one looking into the hall from outside, you can see one of the large golden Buddha statues inside the hall. 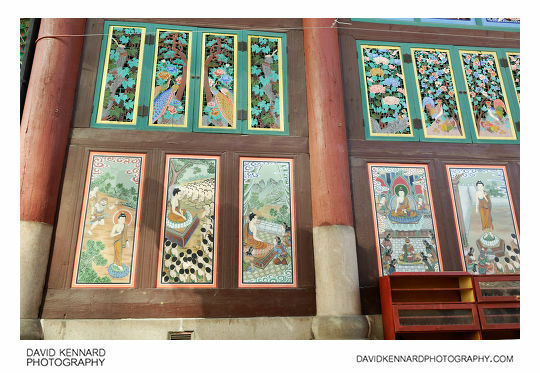 The outside of Daeungjeon is painted in the traditional Dancheong (단청) style, and has paintings of Buddha's life and teachings on the larger panels. The hall itself was built in 1938, though I would imagine that these paintings have been done (or touched up) much more recently than that. This is the steps round the back of Daeungjeon hall. They have a small slide installed at the edge of the steps, but I'm not sure what it would be used for? On the left you can see a shoe rack filled with worshipers shoes. There are large plaques either side of the doors with Buddhist sayings written on them in Hanja. 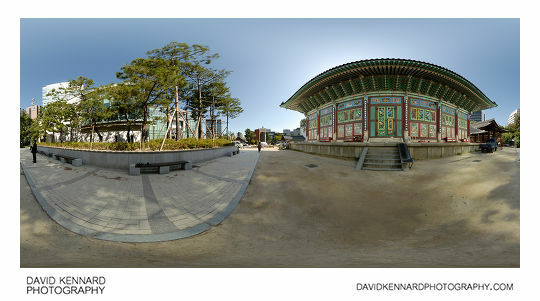 I also took a panorama round the back of Daeungjeon, you can see the 360° VR version here: Daeungjeon, Jogyesa temple 360 VR. The hall is the largest single storey hall in South Korea. Going back up to the Beomjongru bell pavilion (Hangeul: 범종루; Hanja: 梵鐘樓), the gate to enter the room was closed, so I took the above photo from the top of the stairs. You can see the large bell in the centre of the room with a large drum to the right and a large wooden fish carving to the right. I think there should be a gong in there somewhere as well, though you can't see it from this angle. The instruments are sounded by the monks 28 times in the morning and 33 times in the evening. The drum calls land creatures, the bell calls spirits, the gong calls birds, and the fish summons aquatic creatures. 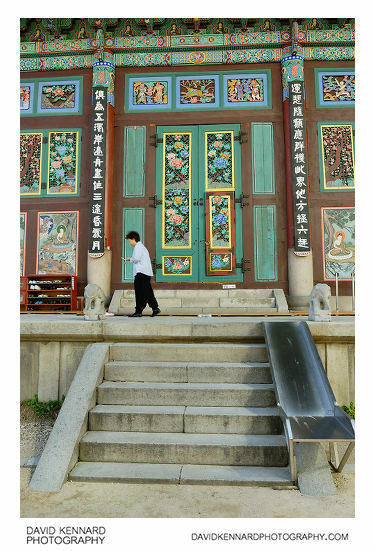 Again, you can appreciate the beautiful and bright dancheong style the building is painted in. To finish off with, above is a photo from the top of the steps up to the Bell pavilion, looking out over Jogyesa. 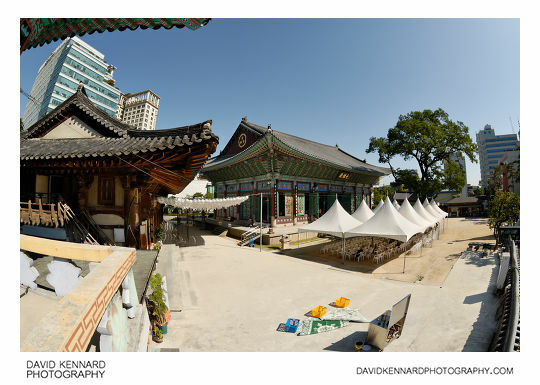 To the left is Geungnakjeon, in the centre is the main hall Daeungjeon, and outside that is a large white marquee with chairs underneath. I'm not sure what the marquee and chairs would be used for, as I thought Buddhists usually worshiped sitting or kneeling on the floor. 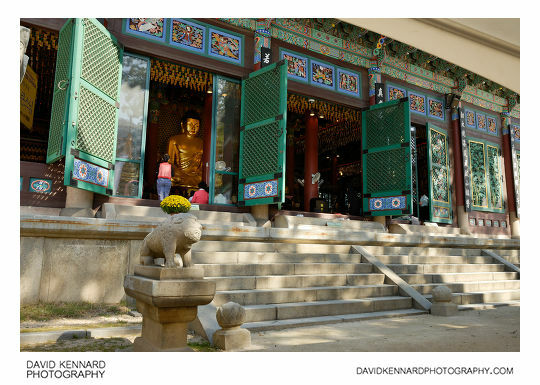 After visiting Jogyesa we went off to see the Insadong shopping / cafe district. 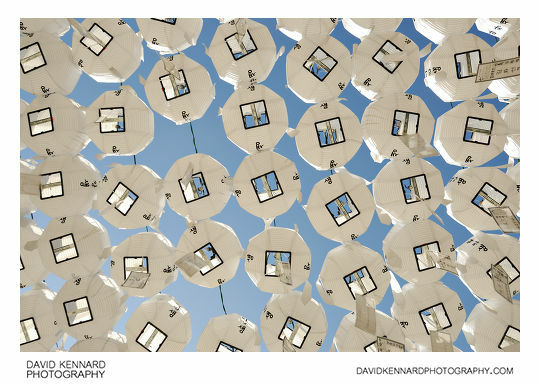 What a great picture, 3053-Buddhist-Paper-Lanterns.jpg. Really does capture the moment. Wondering if it would be possible to use this for a background. I’m creating a poster for the KAM center and their 40th anniversary dinner. I can and will attribute the photo. Hope to hear back from you.